The players are done with minicamp and get a six-week break from field practices before training camp. But questions abound! 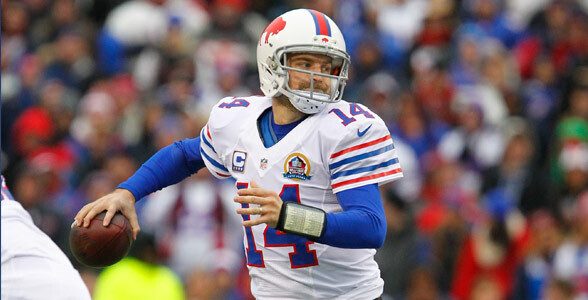 Let’s get to the latest edition of your questions from AskChris@bills.nfl.net and on Twitter @ChrisBrownBills. 1 – Thanks for all you do Chris! Two questions: One, why haven’t we heard much about Jeff Tuel? He hasn’t been mentioned in press conferences or included in any stats. Two, out of all the QB’s, which to you has been most impressive? Thanks Chris! CB: Tuel had not been mentioned much prior to this week because he wasn’t getting much work in practice. Typically it was fewer than five snaps a practice, so outside of individual drills it was tough to get a feel for what he can do. He got some more work in the minicamp this week and has what look to be good physical skills. Clearly the Bills believe he can be developed since he was kept over Tarvaris Jackson. With respect to the quarterbacks as a whole it’s hard not to be impressed by EJ Manuel’s physical ability. The ease with which he throws a pass and the charisma he carries is noticeable and we haven’t seen that around here in some time. Thanks for all of your great coverage every year of our Buffalo Bills. I really enjoy reading all of your updates and breaking news. So my question is around Jarius Byrd. I know he hasn’t signed his franchise tender yet, so what happens if he decides to not sign it at all? What are the Bills options at that point? CB: After July 15th if Byrd still has not signed his one-year franchise tender, the Bills would not be eligible to negotiate a long-term contract with Byrd until after the 2013 regular season is over. So really they’d have no options other than trading his rights. At that point the ball would be in Jairus Byrd’s court as to whether he wants to sign the one-year tender and play this season with Buffalo. In order to get credit for an accrued season in 2013, the latest that Byrd could wait to sign the tender would be November 12th. If he doesn’t sign by then he’s ineligible to play in 2013. If that happens the Bills would be within their rights to place the franchise tag on Byrd again for 2014. The only difference for Buffalo is the compensation in that case would be a first and third-round pick. The current compensation this year is a pair of first-round selections. I loved the draft this year, I think the Bills addressed the needs. I feel we got 2 WR that will be big contributors from day one. The UDFA ,out of all the UDFA we picked up , who do you believe will make this team and becomes a big factor Now? Also do you think guys like Brad Smith and T.Jackson might be gone now that we have filled the holes at QB,and WR. Will we see Byrd this year or is his days in Buffalo numbered? One final question, is Manuel the future of this team? Do you think he can bring this team back to life? He has the size and the arm, but can put it all together to be that guy, does he have what it takes to become a Very good QB in this league, or does it come down to Hope and Prayers? CB: I think among the undrafteds, Da’Rick Rogers and Nickell Robey have both put themselves in good position to land a roster spot, but it’s early and it’s still not real football. The two of them have not looked out of place in practice and have made plays regularly. Again things will be different when the pads are on and I’m admittedly concerned about Robey holding up in the run game at 165 pounds, but we’ll wait and see at camp. Well you were correct about Tarvaris Jackson, but I think he was more a victim of logistics than anything else. Head coach Doug Marrone indicated releasing Jackson was due to the fact that they would not be able to have a proper evaluation of a real competition with three QBs rotating through. As for Brad Smith, he’s performed well in the spring practices and could be a coveted veteran presence among this corps of young receivers. I’m interested to see what he can do now that his offensive focus is solely on receiver. Concerning EJ Manuel, much like I said after the draft, he was the quarterback prospect in this year’s class that has the best chance to be great. Not someone you can win with, or above average, but great. It’s just a matter of how long before that greatness emerges, but it can never hurt to pray. Most Defenses use two D Lines and substitute freely throughout the game, while the O Line usually stays the same except for injury! Why is that? It would seem a rest in the game would also benefit an O Lineman? It would also further develop our backups. CB: While I think some of your points certainly have merit, the offensive line is a different animal from defensive line. On offense those five guys need to work in sync on every play where on the defensive front there’s less of that. Sure there are stunts and twists where ends and D-tackles work together, but it’s limited in comparison to the blocking schemes of the offensive line. So I would attribute the lack of substitution on the O-line to that, the need for continuity and consistency with the personnel in the blocking schemes. What’s your early feeling/assessment on E.J. Manuel from watching him in the spring? I think we are way overdue for a Franchise QB and hope is he the guy. CB: As I stated above his physical ability is impressive. In terms of his physical talent he’s probably comparable to Cam Newton in terms of mobility and throwing arm talent. Manuel needs time on the field in the practice setting and he’ll get that now with one less quarterback in the rotation. I think this offense caters well to a young signal caller, so if he wins the competition I think he’ll be able to make progress each week as a rookie. I just haven’t seen enough of him to know if it’s fair to expect the wild success that the rookies last year like Luck, Griffin and Wilson had out of him in 2013. Even though players understand the business of the game leads to transactions like the release of QB Tarvaris Jackson Monday, they still respected the work that he put in during his time with the club. EJ Manuel and Kevin Kolb were both asked about the benefit of getting more reps with Jackson no longer on the roster, and both made a point to comment on the time they spent with Jackson this spring before answering the question. “First of all I enjoyed my time with Tarvaris I thought he was a heck of a player, super talented and a heck of a guy,” said Kolb. Kolb even took the time to call Jackson after he had been released. Coach Marrone explained that it was a tough decision, but that it had to be made to gain a clearer picture on the quarterback competition. Rotating three men through with the offense was not accomplishing the goal in an effective way. Still, it didn’t mean Marrone lacked any respect for the work that Jackson put in during his time at One Bills Drive. Through the course of the OTA practices it was Tarvaris Jackson and Kevin Kolb getting the majority of the reps while EJ Manuel got noticeably fewer snaps. It may have seemed peculiar on the surface knowing Manuel would need all the snaps he could get in order to get up to speed sooner rather than later. Now looking back Buffalo’s offensive staff may have been using OTA practices for a much different purpose. As their first-round pick Buffalo’s offensive staff knew that Manuel was going to be one of their top two quarterbacks on the roster regardless of how much work he got in OTAs. He is the long term investment. What they probably didn’t know for sure was which quarterback would serve as his stiffest competition. Perhaps that’s what Doug Marrone and Nathaniel Hackett were working on in terms of decision making in having the two veteran QBs get most of the work through the OTAs. Kolb and Jackson provided enough practice tape for Marrone and Hackett to make an evaluation and determine which quarterback would serve as Manuel’s main competition in training camp. With the release of Jackson, it will obviously be Kolb. The release of Tarvaris Jackson presents an obvious plus in getting top pick EJ Manuel up to speed. During OTA practices it was Tarvaris Jackson and Kevin Kolb getting the majority of the reps in team drills. EJ Manuel was third in terms of snaps in practice. That all changes now. With Jackson no longer on the roster Buffalo’s top draft choice will get a good deal of reps in practice in this week’s mandatory minicamp and training camp. That should serve the rookie QB well as he tries to compete for the starting job. Bills head coach Doug Marrone knows he’s going to be asked constantly about the state of the quarterback competition, but he’s sticking to his original plan as to how a starter will be reached. Obviously any coach would want to have a defined answer at that position sooner rather than later, but sometimes it takes until the first or second preseason game for there to be any defined separation between the candidates. Quarterback Tarvaris Jackson spent last year on the Buffalo Bills roster. But it ended there. He never took a snap in a game. Now, with a new contract, Jackson is back and looking forward to competing for playing time at the quarterback position. Jackson was on hand this week for the start of the Bills Voluntary Offseason Conditioning program. And he told reporters at One Bills Drive he’s looking forward to a second chance to show the coaching staff that he can play. The Bills acquired Jackson in a trade with Seattle last August. He was inactive for all 16-games, but the Bills re-signed him to a free agent contract in February. Jackson says his understanding with Bills GM Buddy Nix essentially hasn’t changed since he came here last August–he’s expected to work hard and see if he can get some playing time at quarterback. With the announcement that Tarvaris Jackson has re-signed with the Bills, head coach Doug Marrone made it clear that the starting quarterback job and every other position on the roster is up for grabs. A team-wide open competition is not uncommon when a new coaching staff is hired, and that will be the case under Marrone for the Bills. Knowing players have to prove themselves to a new staff, there’s sure to be intense position battles at training camp this summer, including starting quarterback. Has Chan Gailey maintained a 100% offensive play calling role or has he given some or all of the play calling authority to Curtis Modkins? Some of the talk this year is about the “Pistol” Offense run by Washington. Am I correct in my assessment that it is an offense that is an extension of the “Wild Cat” and the only real difference is the Pistol is run with a true starting Quarterback who has the athletic ability to run as well as throw the football? CB: Yes, Chan Gailey is still the only offensive play caller on the roster. When first hired, Gailey mentioned that he intended to eventually turn over play calling duties to a coordinator, but I don’t see that happening any time soon. Your assessment of the Pistol offense is not wholly accurate. The Pistol just references a backfield formation where the single back lines up directly behind the quarterback, who is in the shotgun. One of the advantages of this look is it does not tip off to the defense which direction a run play is headed. Washington runs out of that formation with Robert Griffin a good deal, but Chan Gailey first popularized it in the league in Kansas City a few years ago running it with Tyler Thigpen there. The Bills have even made use of it this season at times. CB: I can tell you that won’t happen, although the Redskins did draft a pair of quarterbacks last spring (Robert Griffin III, Kirk Cousins). I can say that the Bills will likely draft one this spring. Here’s what Buddy Nix said on the subject. I think the game against the Colts was when CJ split out wide and got chased by a linebacker. He beat his guy right at the snap but Fitz missed the throw, my question is, why not try that every game when there’s clearly a mismatch with almost any linebacker vs Spiller and a chance for a big time play? CB: I can tell you that it’s relatively rare to get C.J. Spiller matched up on a linebacker. It’s why defensive coordinators spend as much time as they do with their game plans to avoid such mismatches. When the Bills do get them they have to make opponents pay. Unfortunately they were unable to do so in that situation. What was the thinking behind the trade for TJack? And if Nix is talking QB lately it would seem that he thinking of going away from Fitz which is understandable so why not give the guy some reps in practice to see what he has? Or will this turn out to be another trade that does nothing for the Bills? CB: Buddy Nix has gone on record as saying the trade was made with Tarvaris Jackson serving purely as an insurance policy at the quarterback position. Ryan Fitzpatrick is the quarterback they have hitched their wagon to and they do not intend to make a change at the quarterback position so long as Fitzpatrick is healthy. It was my pleasure to be part of the Bill’s crowd at the Jags game. I saw many excited fans doing their best to back their team. Are the players aware of their fans presence at away games? Do you think it is of any value to the team? CB: Bills players do recognize Bills fans at away games. In fact at the Cleveland game back in Week 3, when most Browns fans had filed out, more Buffalo fans came down to the lower seats in the one end zone and near the end of the game the players could hear the Bills fans singing the ‘Shout’ song and were pumping their fists at them. After the game they came over and shook some hands with the fans that made the trip. So you are noticed and heard! Bills head coach Chan Gailey has had a few conversations with QB Tarvaris Jackson this week. It’s rooted in preparing for his former team on Sunday, the Seattle Seahawks. When asked if getting some info on an opponent’s personnel is a big help, Gailey downplayed it a bit.